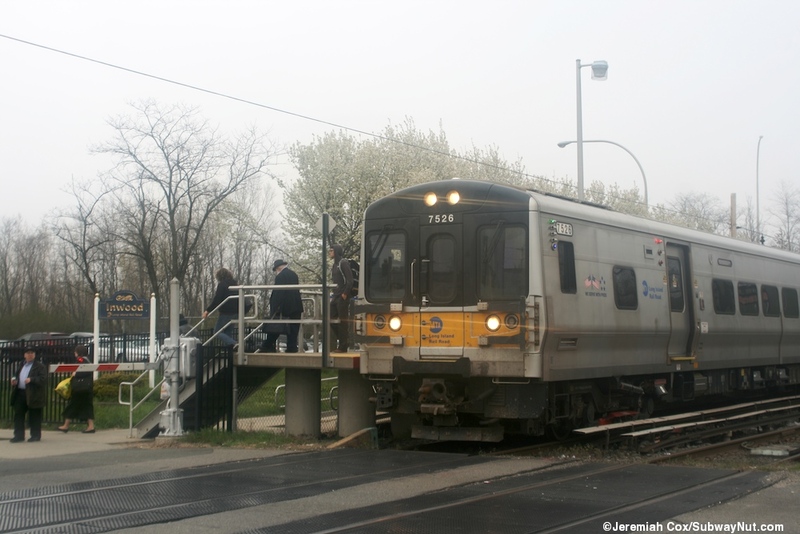 Inwood is the last station in Nassau County on the Far Rockaway Branch before it reenters Queens to the Far Rockaway terminus. 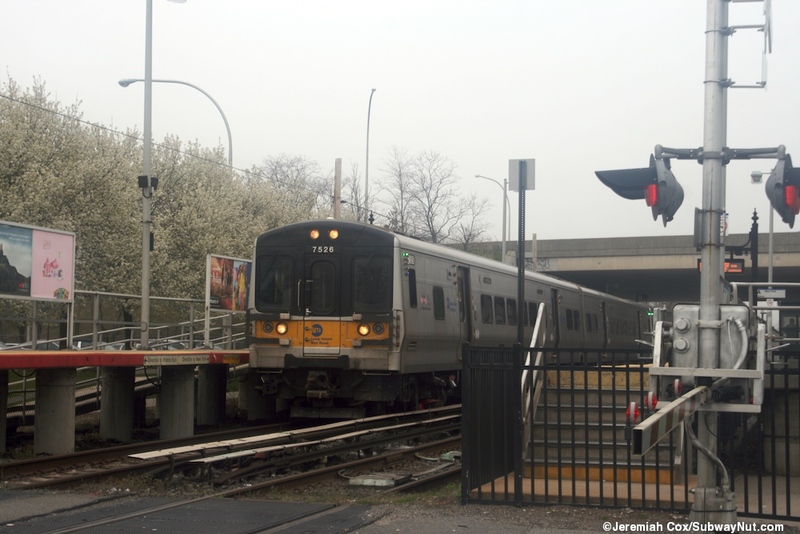 It has two side platforms for the two track line that can accommodate 6 cars nestled beneath the Overpass Bridge of Nassau Expressway, NY-878, a wide Boulevard with traffic lights. 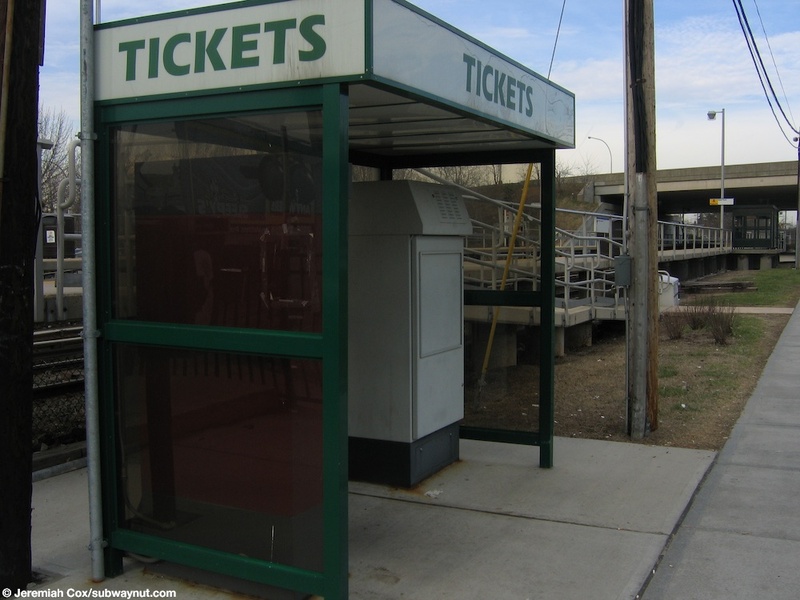 The station lacks a building and the platforms lack any further amenities for waiting passengers (waiting under the overpass does offer protection from the elements) except for a single green shelter. 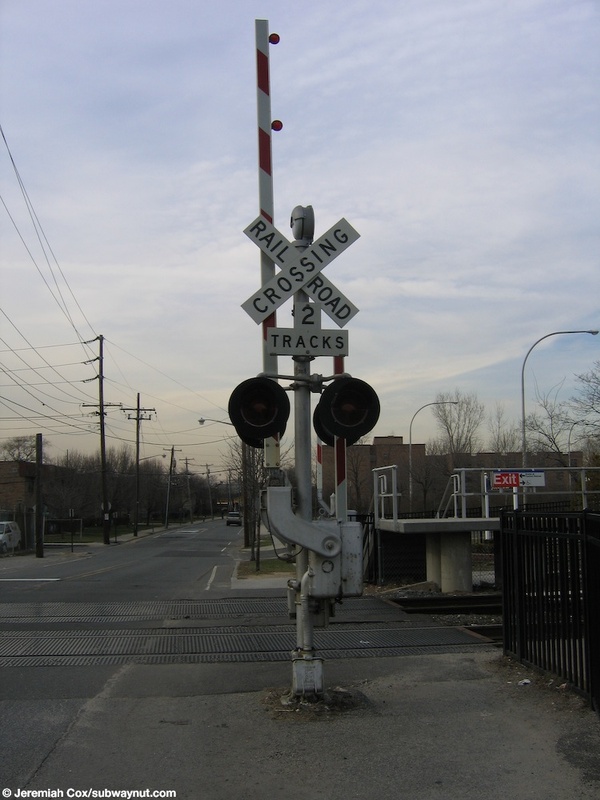 The simple low-level platforms begin at the grade crossing of Doughty Blvd with the bumper blocks of the two tracks of the tiny Far Rockaway Yard visible opposite the platforms. Here are decent sized parking lots. 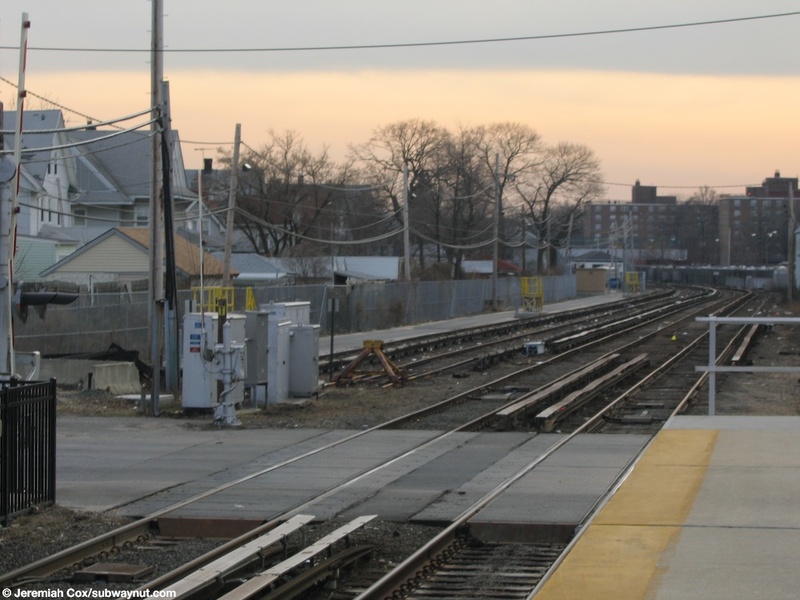 The north one along the Far Rockaway-bound platform is free and unrestricted. The south lot requires a Village of Lawrence Residency permit. 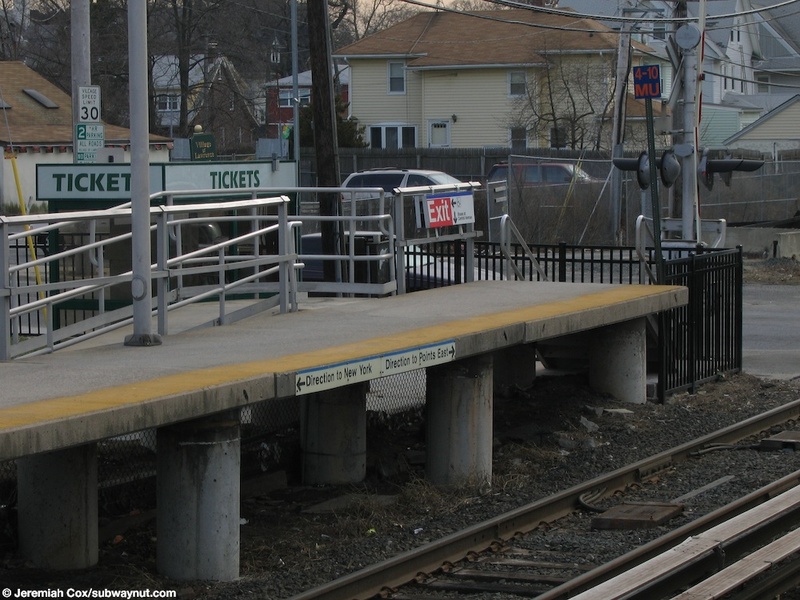 Here a ramp and two staircases lead up to each platform with two TVMs inside a shelter along the Jamaica-bound platform. 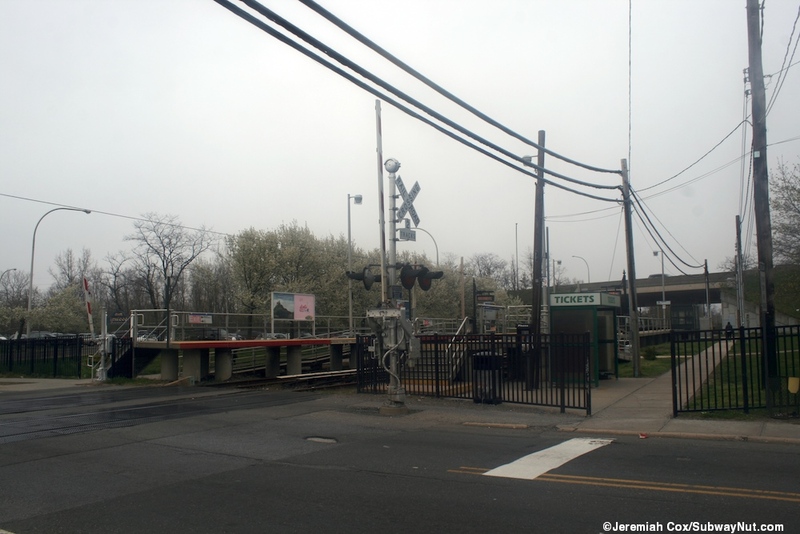 A sidewalk runs parallel to each platform at ground level also beneath the underpass (and is used by residents to get under the Nassau Expressway and reach houses on the otherside). The only pedestrian crossing is the car grade crossing but the Jamaica-bound end of the platforms each have a single staircase down to the sidewalk parrellel to them. These sidewalks lead down to what is now separate sections of Lord Avenue, I assume the station once had a second grade crossing. 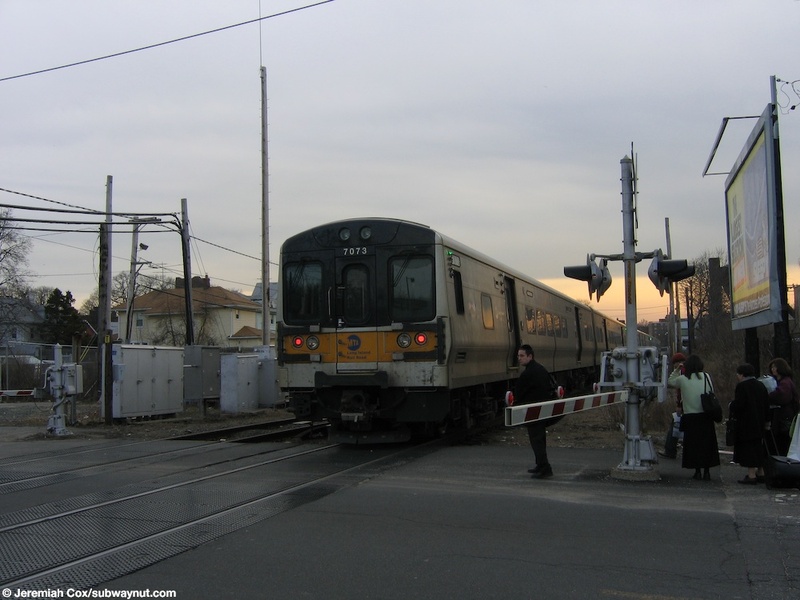 The single street from the Far Rockaway-bound paltform has two names (according to Google Maps) Pearsall Avenue and Lord Avenue while the New York-bound platform leads to Lord Avenue just north of Cumberland Place. 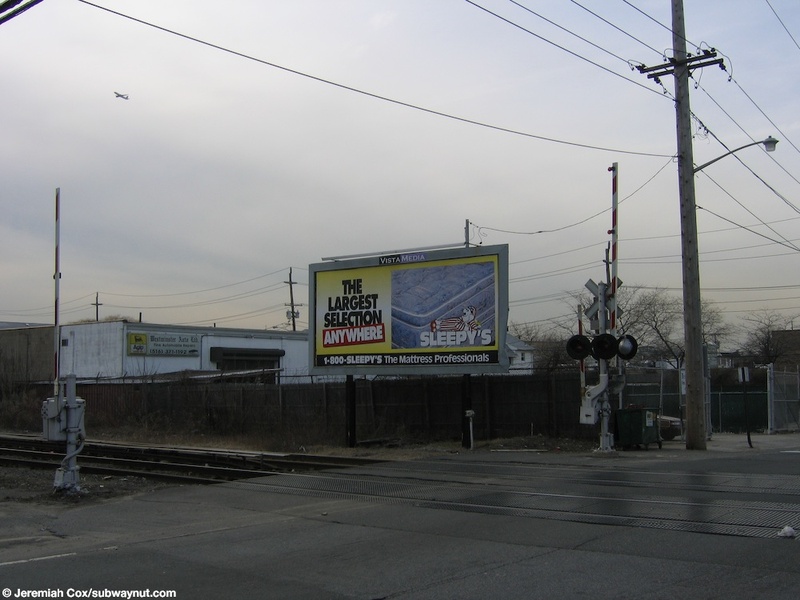 An ad just south of the grade crossing that is the southern end of the platforms at Inwood. 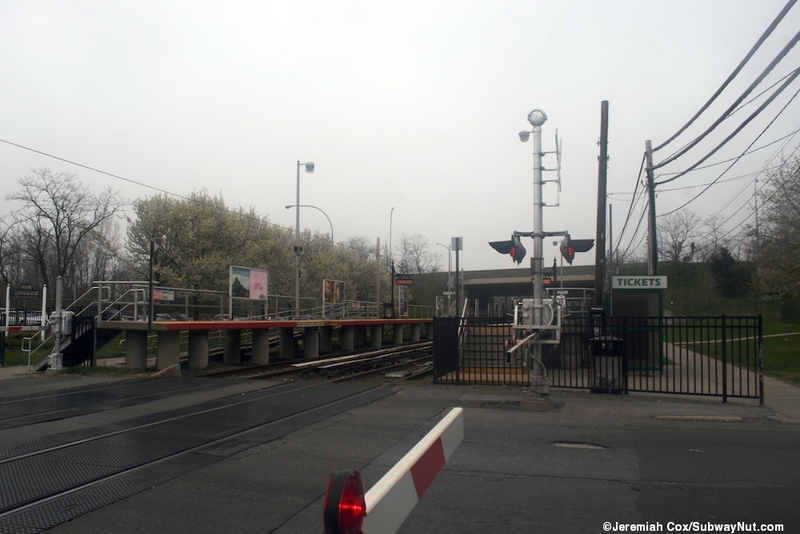 The southern end of inwood station is a two tracks grade crossing. 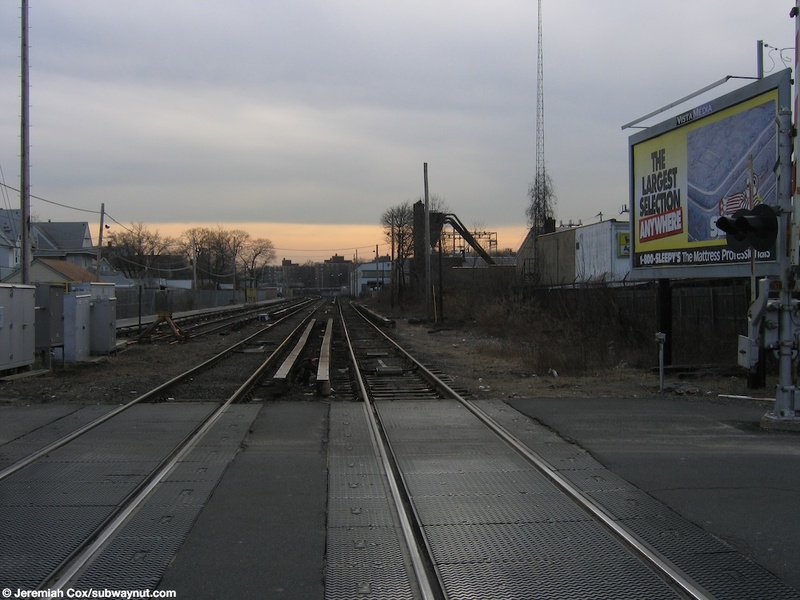 Looking down the tracks into a cloudy sunset at Inwood. 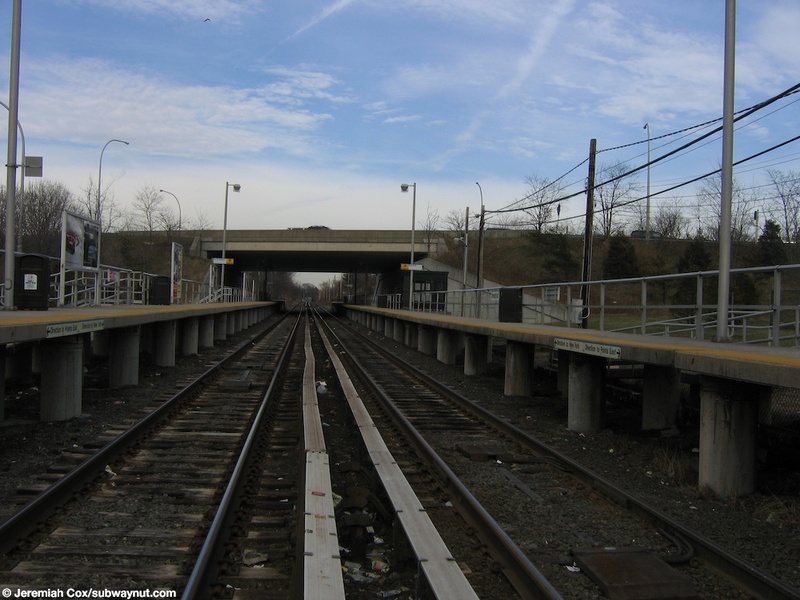 Looking down the tracks with there thrid rail from the grade crossing at the southern end of the platforms at Inwood. 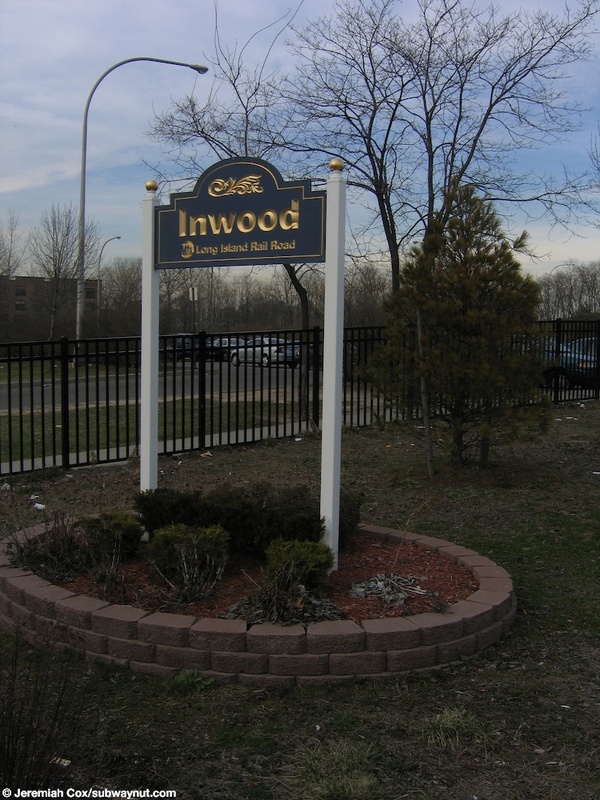 An Inwood Station sign with some greenery around it. 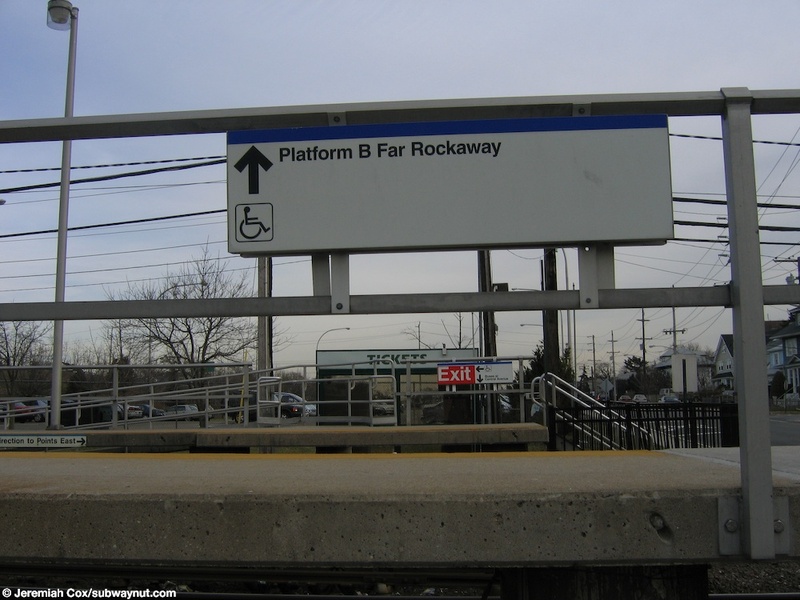 A sign for the ADA ramp up to Platform B Far Rockaway at Inwood. 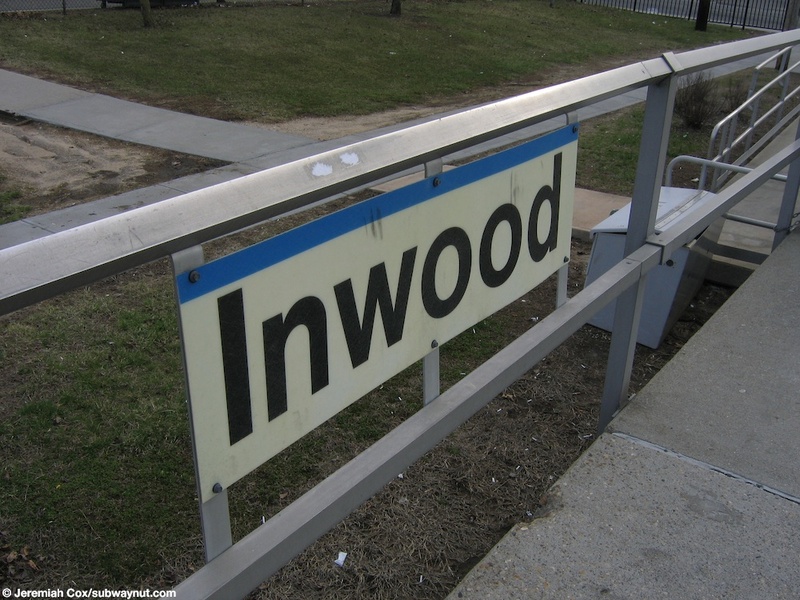 An Inwood Station sign on the platform. Looking down the platform at the tracks south of Inwood. Looking down the platform at Inwood towards a sign on the platform edge for the directions of travel as well as the kiesok where ticket machines are. 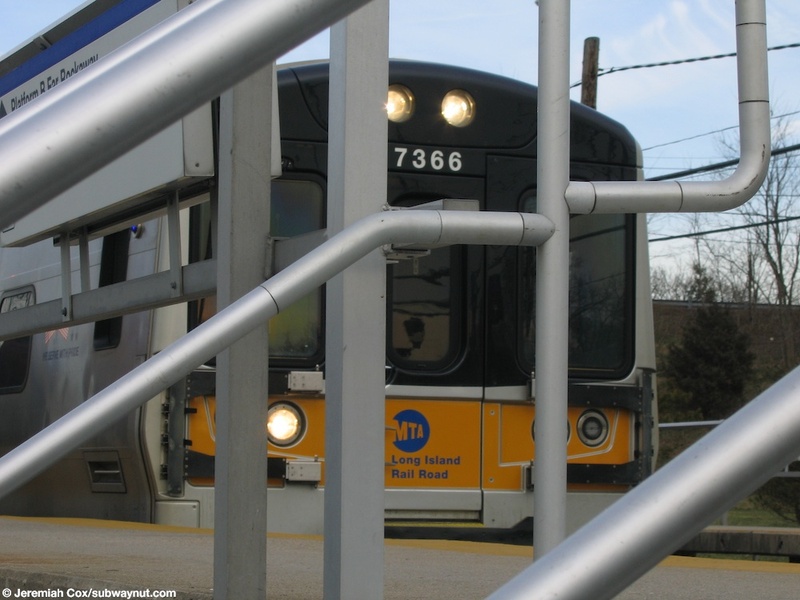 A close up of the TVM kieosk at Inwood. 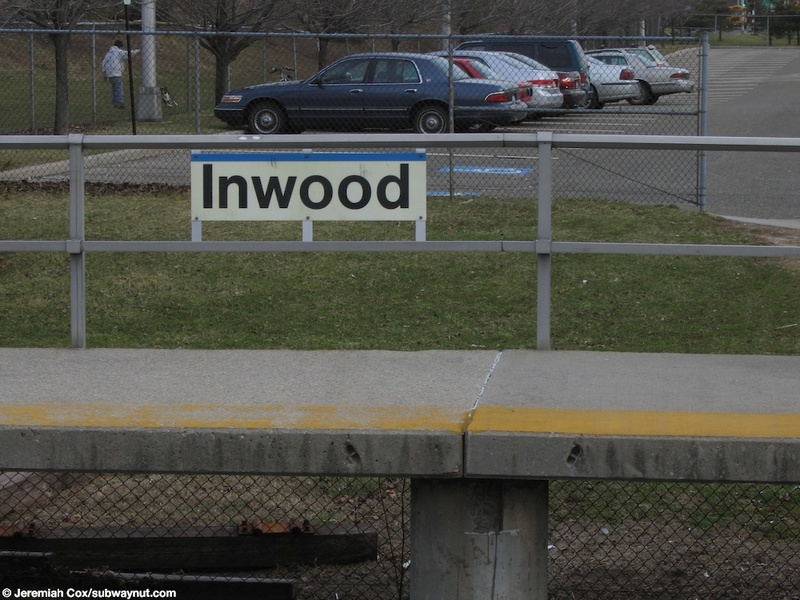 An Inwood Station platform sign. 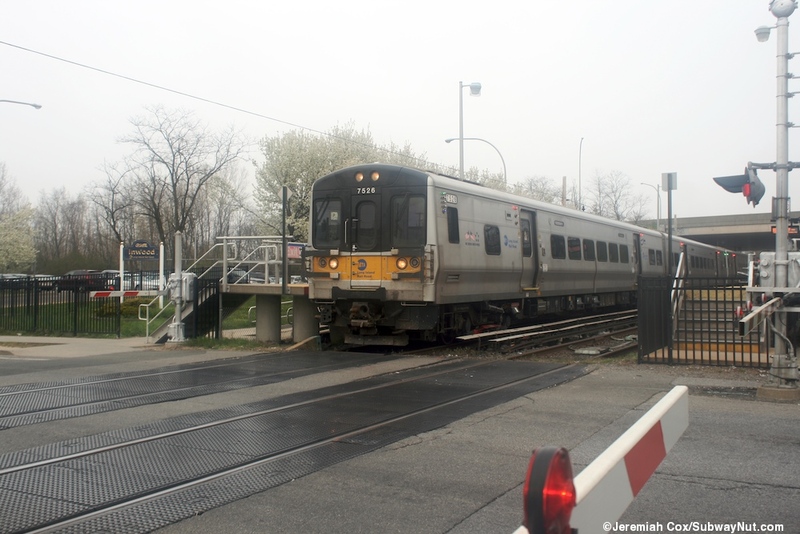 Looking through the frences along the Far Rockaway platform as M7 #7366 stops at Inwood bound for Far Rockaway. 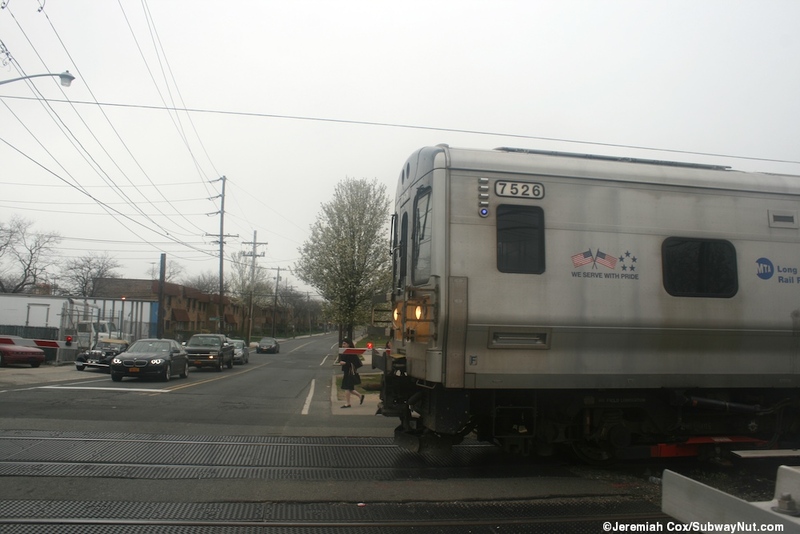 M7 #7366 begins going across the grade crossing as it leaves Far Rockaway. 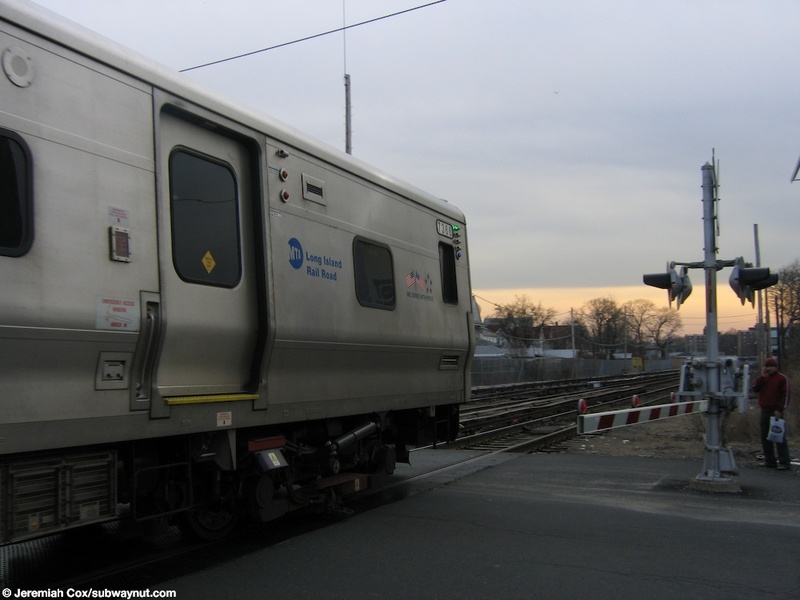 M7 #7073 and a Far Rockaway-bound peak hour train leaves Inwood to continue into the sunset.